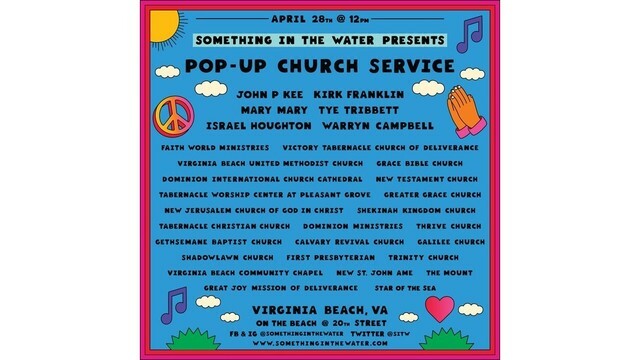 The artists and churches coming to the Sunday Pop-Up Church Service during the Something in the Water festival on April 28. VIRGINIA BEACH, Va. (WAVY) -- One of the many unique programs coming to Pharrell Williams' Something in the Water festival is the Pop-Up Church Service on the inaugural event's last day. Though it might seem like a cooldown from a jam-packed weekend of hip-hop, R&B and other music genres, the star-packed lineup of gospel music looks to be anything but, and well worth making it back out to the Oceanfront at noon that Sunday. Kirk Franklin, Mary Mary, John P. Kee and other national artists will join two dozen local churches in the event at on the beach and 20th Street. And unlike the rest of the weekend's big events, the church service is free and open to the public. Passes for Something in the Water's first two days, April 26 and 27, are sold out on the event's website. Everyone from Pharrell to Missy Elliott and Pusha T will be representing the 757, with superstars such as Usher, Snoop Dogg, Gwen Stefani and more also set to take the stage. Virginia Beach's Timbaland and N.E.R.D. (a group featuring Pharrell), as well as Busta Rhymes, were just added to the lineup on Tuesday. Look for the detailed scheduled of performances to be announced in the next week. Check out WAVY's full coverage of the Something in the Water festival on our Living Local page here.